Go to “File”, “Options”, “Customise Ribbon”. In the tab “Popular Commands”, select “All commands” in the drop-down menu. Now, search for the “Speak” command in the alphabetically sorted list and select it. In other Word versions, this command can be “Voice” or “Text in voice”. Next, choose a tab in which the “Voice” command can be located, for example, “Home” and click in the middle on the button “Add>>”. Once you have placed the new command, click on OK. 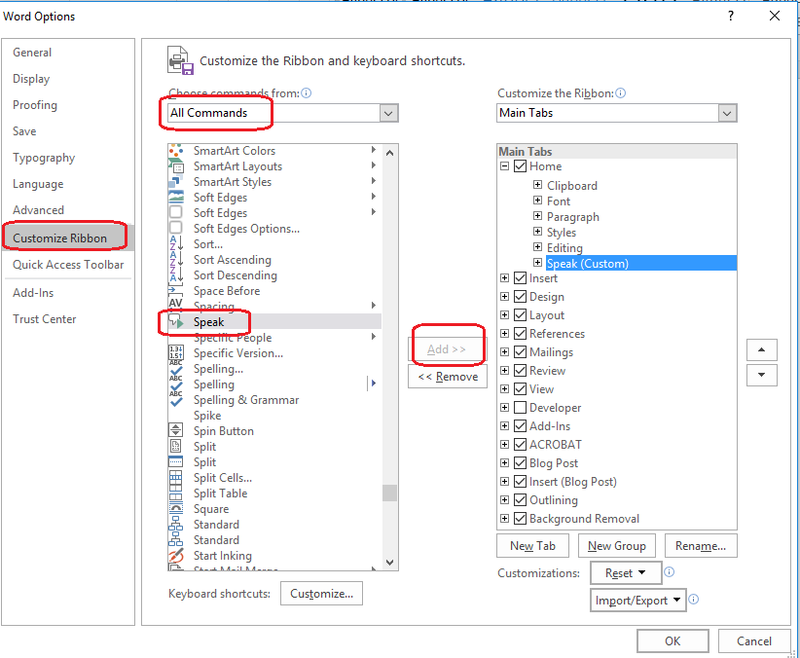 Select the text that you want Microsoft Word to read and click on the Speak icon at the toolbar. This entry was posted on August 12, 2017 at 5:41 pm and is filed under Microsoft Office. You can follow any responses to this entry through the RSS 2.0 feed. You can leave a response, or trackback from your own site.